Darjeeling MP Surendra Singh Ahluwalia’s promotion as a minister of state and induction into the Union cabinet - the first instance for a Member of Parliament from Darjeeling since Independence - has brought mixed reactions from political parties of the hills. The Gorkha Janmukti Morcha welcomed Ahluwalia’s induction, saying it reflected the respect and sense of inclusiveness the BJP-led government has accorded to the people living in Darjeeling and the Dooars region. In a press statement, GJM president Bimal Gurung congratulated the Darjeeling MP and extended his gratitude to Prime Minister Narendra Modi. “With Ahluwalia joining the Union Cabinet, not only Darjeeling but the entire region of north Bengal will find representation at the highest policy making body of the country, and he will now be able to push for transformation of this region for the better. This also shows Modiji’s commitment towards the people of Darjeeling and we look forward to the day when all our long pending demands will be fulfilled,” Gurung said, without specifying his party’s statehood demand. Over the years,the Darjeeling hills did have representation in both the lower and upper Houses of Parliament, mostly from the hill units of national parties such as the Congress and the CPM. This is the first time that a Darjeeling MP has been appointed as a minister of state and inducted into the Union Cabinet. The All India Gorkha League (AIGL) and the Gorkha National Liberation Front (GNLF) too welcomed the development but were cautious with their words. “It is a good gesture for the hills and hope it will benefit us. As for the statehood demand, only time will say what impetus Ahluwalia will bring,” said Pratap Khati, the AIGL general secretary. Ahluwalia a minister of state is to give a Sikh minister as this will help the party in the Punjab election. 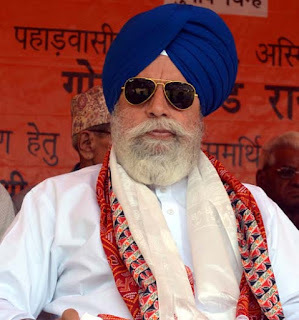 It is also a strategy to help the GJM garner votes in the next Lok Sabha election as in the recent state Assembly election, the Morcha’s vote share decreased drastically,” said the JAP chief, adding Ahluwalia’s new role would only be a hindrance to the statehood demand.